Many football fans do not care much for the preseason because of the quality of the football that is often played. They are not wrong, but at the same time, it is not all bad. An argument can even be made that the preseason is kind of awesome. Think about it—NFL football games are on television starting Thursday night and running through Monday night. So, five nights a week you can say,” Sorry honey, but the game is on,” and you’re not lying! Yes, it would be nice if the quality of the game would be a little better, but hey—it’s preseason. It’s that time of year when coaches have to figure out who can play and who can’t. That way, when the regular season starts the quality of the game can meet expectations. However, occasionally some teams do play decent football during the preseason. 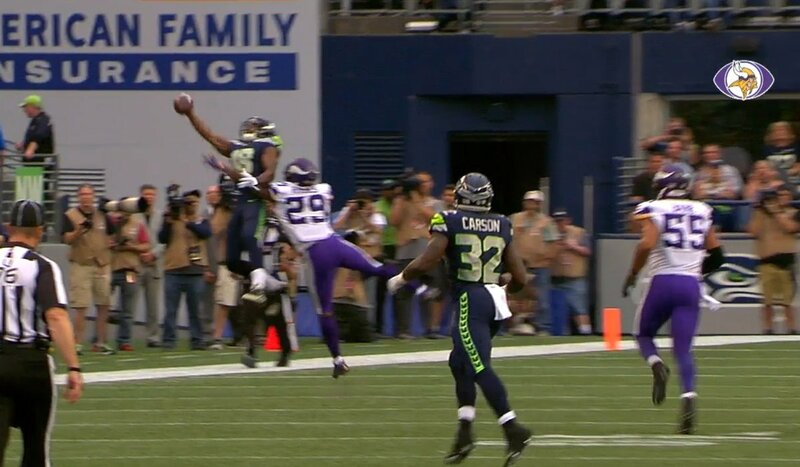 Friday night, got to enjoy a good game (by preseason standards) between the Minnesota Vikings and Seattle Seahawks. Russell Wilson is ready to lead his guys back to the Promised Land (Super Bowl). He was playing a good Vikings defense but still managed to complete 13 of 18 passes for 206 yards and two touchdowns. Whether he needed to get the ball downfield, into a tight window or had to throw on the run—he made it happen, and he made it look easy. Eddie Lacy’s roster spot is not safe. Gaining just 20 yards on six carries is not going to earn him a roster spot. He showed what he has the potential for on his first carry when he ran guys over to make a nice nine-yard gain. But other than that, he was nothing special. His competition, on the other hand, looked pretty darn good. Chris Carson was much more effective (six carries for 27 yards; one reception for 17 yards). Alex Collins had a 93-yard night (58 yards on 10 carries; 35 yards on four receptions). Carson also laid a nice block on Everson Griffin in the first quarter and forced a fumble on special teams. Mike Davis had a little trouble breaking free at times, but his 38-yard run was a thing of beauty as was his 22-yard touchdown catch. Kasen Williams may be worth stashing on your fantasy roster if you have a space on your bench. He followed up a solid outing in Seattle’s preseason opener with another good one Friday night (two receptions for 28 yards and a touchdown). “I’ve been on the practice squad for two years now and quite honestly I’m tired of it,” Williams said. We can pump the brakes on Trevone Boykin (5-8 for 55 yards; two sacks) a little, but then again, with Wilson playing the first half, he didn’t get much of a chance to find some momentum. Seattle’s offensive line woes continued with left tackle George Fant tearing his ACL in the second quarter. 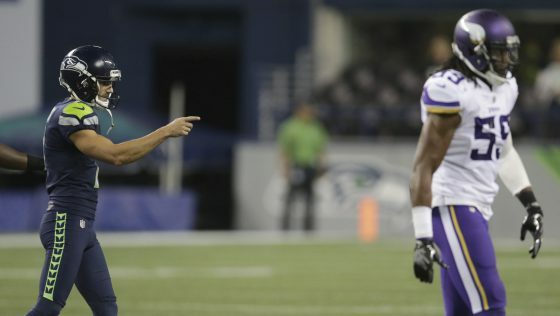 It seems that the Vikings were picking on their former kicker, Blair Walsh, who is now playing for the Seahawks. So, being the tough guy that he is, he gave it right back to them. The Vikings need to make Stefon Diggs the focal point of their passing game. He is a playmaker just waiting for the ball to come his way. When it did Friday night he did something with it (four catches for 65 yards). He made a fantastic catch on a deep ball, and made an even better one on a quick, short route when he knew he was going to get clobbered. But he made the catch and got the first down anyway. Dalvin Cook looked more like the guy the Vikings hope he’d be when they drafted him (seven carries, 40 yards; one catch, ten yards). Sam Bradford is looking better than he did last year. But if the Vikings are going to win games, he has to finish off drives in the end zone. His first drive was a very nice 11-play, 76-yard effort that stalled at the 12-yard line. Part of the reason was Bradford and penalties were also to blame. Both teams showed promise, Seattle more so than Minnesota. It will be interesting to see how both do in the all-important third preseason game. The Vikings will face the San Francisco 49ers at home next week (8/27) with kickoff at 8 PM ET. Seattle will face the Kansas City Chiefs next Friday (8 PM ET kickoff).